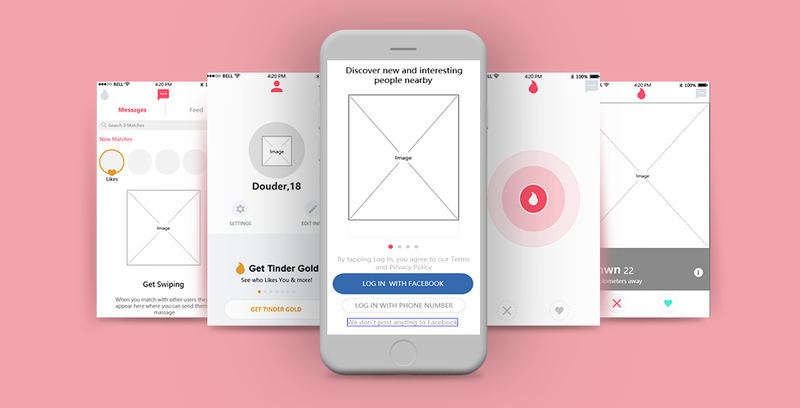 Tinder is a location-based social search mobile app thatallows users to like (swipe right) or dislike (swipe left) other users, andallows users to chat if both parties swiped to the right (a match). The app isoften used as a hookup app. Information available to the users is based onpictures from Facebook, a short bio that users write themselves, andoptionally, a linked Instagram or Spotify account. The components used in this prototype template are “Checkbox Group”, “Text Input”, and “Circle” components. It also uses “Shape” and “Text” componentsto trigger page jump, and also uses the selection of components to trigger buttonstate change. of this prototype: Link Page，Login Page, Home Page,Messages, Feed,Personal homepage, etc. All pages of the album (10 pics in total) can be downloaded here.